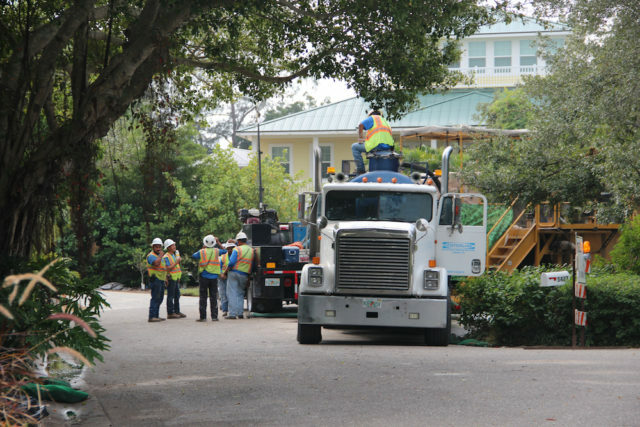 Some concern arose last fall when a contractor ran into vibration problems in the Siesta Cove neighborhood as work was underway to install a new water line and a new sewer force main between Siesta Key and the mainland. 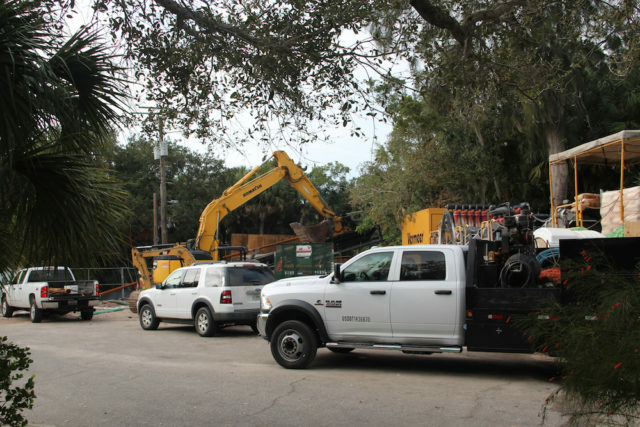 A hairline crack in a homeowner’s garage temporarily put on hold the project designed to lead to the decommissioning of the Siesta Key Wastewater Treatment Plant by the end of this year. Greg Rouse, the county’s utility asset manager, explained to The Sarasota News Leader in early November 2016 that county staff was being extra cautious after the damage was discovered during a preliminary step in preparation for drilling under the Intracoastal Waterway (ICW). Nonetheless, he reassured the News Leader that when the time came to do the serious underground and underwater boring, the equipment would be up to the task. 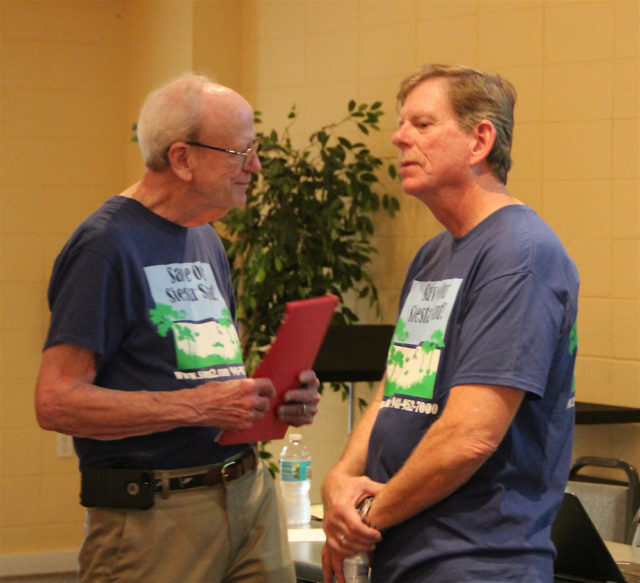 That has proven true, as Robert Luckner, a member of the Environmental Committee of the Siesta Key Association (SKA), recently explained to members. The $20-million project is “on schedule,” Luckner said during the Feb. 2 SKA meeting. On Jan. 2, the contractor resumed operations relative to the ICW crossing, according to a county email blast sent to persons who have registered for the updates. A Feb. 6 email blast from county staff pointed out, “There will be two [horizontal directional drilling] ICW pipe pullbacks.” The first was scheduled to begin on Feb. 7, wrote Billie R. Havey, a spokeswoman for the county’s Public Works Department. The contractor would need to work continuously until that step was completed, which was expected to take 24 hours, she noted. The second pullback was estimated to begin either Feb. 14 or Feb. 15, Havey added. “It is anticipated that the pipe pullbacks will be completed by Feb. 16,” she wrote. Havey was referring to the process through which the contractor is installing the water and sewer main lines, as Luckner reported on Feb. 2. The pipelines went into the ground at Phillippi Estate Park at 5555 S. Tamiami Trail and were planned to come up at South View Drive on Siesta Key, in Siesta Cove. In the meantime, Luckner said, the contractor had removed the old equipment, as planned, from the wastewater plant site. That work began in December 2016, he noted. As of Feb. 2, Luckner added, the contractor had “dug a big hole,” poured concrete and was preparing to begin installing the new equipment that will transform the plant into a master pumping station to send effluent to the mainland. 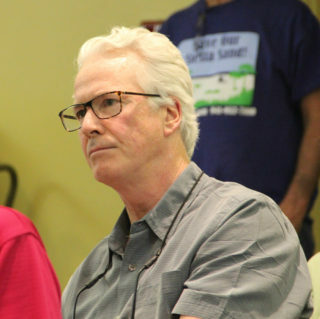 Luckner added that he was certain South View Drive residents were not disappointed by the news about the shift to the horizontal directional drilling. After the school year ends, Luckner told the SKA members — in late May or early June — the sewer main will be extended from Midnight Pass Road along Shadow Lawn Way and then Shadow Long Drive. For about a month, he noted, the Shadow Lawn Way entrance to Siesta Isles will be closed. After he and his wife, Catherine — the SKA’s vice president — joined then-Siesta Isles Association President Tony Romanus in discussions with county staff last year, Robert Luckner continued, the staff agreed to install a temporary traffic light at the intersection of Beach Way and Beach Road, to facilitate Siesta Isles residents’ ability to enter and exit the neighborhood via that access. Romanus explained to the News Leader last summer that Beach Road traffic flows so heavily through that intersection, using Beach Way to get into and out of the neighborhood is a challenge for residents. 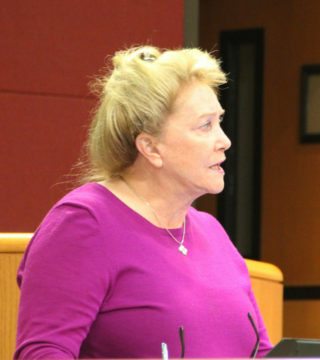 During the Jan. 25 County Commission meeting, Margaret Jean Cannon was among numerous Siesta residents who voiced concerns about traffic relative to the proposed Siesta Promenade project at the intersection of U.S. 41 and Stickney Point Road. One big issue that seems to have been overlooked in the traffic studies the county is requiring of Benderson Development, she said, is that congestion at the south access to the Key affects the north access. 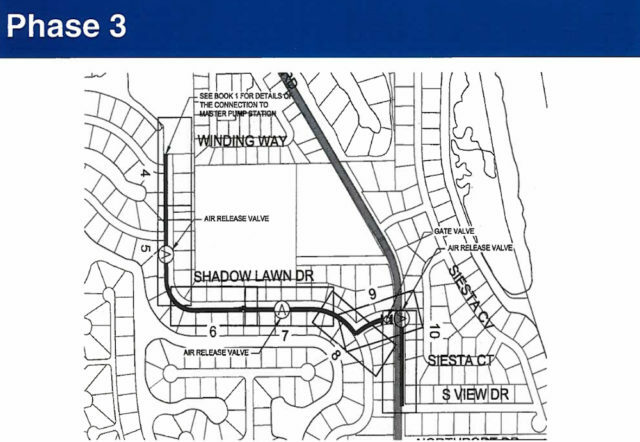 “As soon as the south end begins to back up,” Cannon told the board, people head north, to Siesta Drive. The City of Sarasota’s utility project on Siesta Drive just east of the north Siesta bridge in mid-January produced such long lines of waiting vehicles, she continued, that drivers started eschewing the north route to the island in favor of Stickney Point Road. That was an excellent example of what happens, she explained. Therefore, she said, the traffic studies for Siesta Promenade need to include analysis of the potential for congestion on Midnight Pass Road and Higel Avenue, as well as on the part of U.S. 41 in the vicinity of Siesta Drive. No commissioner addressed those comments in the discussion of the scope of work, and staff did not include those road segments on its list of areas Benderson’s consultant will have to analyze. In late January, Matt Osterhoudt, interim director of Sarasota County’s Planning and Development Services Department, notified County Administrator Tom Harmer that the Federal Emergency Management Agency (FEMA) has informed the county that it is eligible to claim reimbursement for disaster-related expenses associated with then-Tropical Storm Hermine on south Siesta Key. 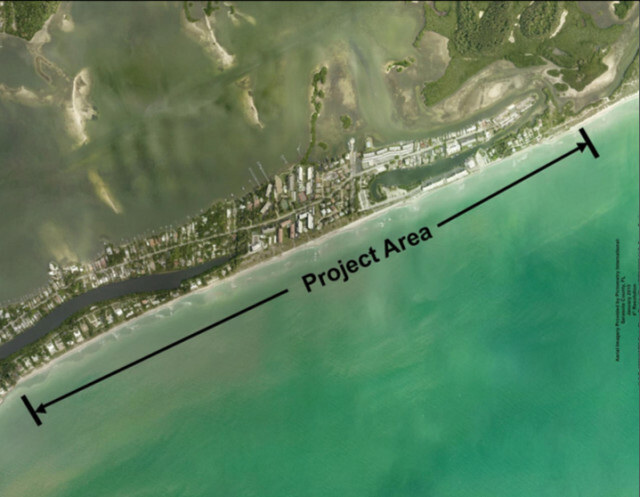 An approximately $21.5-million project to renourish about 2 miles of that part of the Key — including Turtle Beach — was completed in late April. Osterhoudt added in his Jan. 24 email that staff was in the process of surveying the area “to determine the scope of the issues and a potential project.” Staff also met that week with FEMA representatives in Sarasota, he noted. “From what we understand,” Osterhoudt continued, “there would be some level of matching funds required to move forward with this initiative. “We will provide an update to administration when more information is available regarding the extent of the affected area, what a project could entail, the associated funding plan, and next steps,” he wrote. In early September 2016, staff surveys of the shoreline following Hermine’s passage found that an area at Turtle Beach showed signs of beach erosion and approximately 5 to 10 feet of dune erosion, including a limited loss of some of the recently planted dune vegetation at the south end of the project area. SKA Vice President Catherine Luckner has continued to keep her composure even as City Manager Tom Barwin has recited — and written — a different version of his outreach to the SKA than she recalls. As recently as Feb. 6, when Barwin provided the City Commission an update on the Lido Renourishment Project, he mentioned his efforts to “communicate with the objectors as much as we can …” He was referring to the SKA and Save Our Siesta Sand 2 (SOSS2), which have filed administrative challenges over the Florida Department of Environmental Protection’s Dec. 22, 2016 Notice of Intent to issue a permit to the city and the U.S. Army Corps of Engineers (USACE) to dredge Big Pass. The SKA also has alerted the city and the USACE of the potential of its filing a complaint in the 12th Judicial Circuit Court. When she addressed the County Commission on Feb. 7, Luckner repeated comments she also has made to SKA members, so they would know her side of the story. Last December, she told the commissioners, Barwin called her at home “three days before Christmas weekend” and asked about setting up a meeting that week. She told him she would be free both on Dec. 21 and Dec. 23. However, she continued, she made it clear to him that she would be out of town with her mother on Dec. 22. Although she ran out of time to finish her story that morning, she did get to complete it several days earlier, at the Feb. 2 SKA meeting. When Barwin called her, Luckner asked him about whether any county staff members would be present. He told her, she continued, that he knows County Administrator Tom Harmer, adding, “‘We work well together,’” and indicating he would get Harmer to join them. When Barwin finally called again, she added, it was about meeting on Dec. 22. She found it ironic, she noted, that he would want to schedule the meeting the same day the FDEP issued its Notice of Intent — and the single day of that week she had told him she would be unable to come downtown. “I have never frankly met the man,” she added. 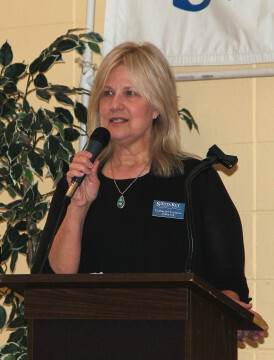 An SKA audience member on Feb. 2 pointed out that Barwin’s guest column in the area publications said, “We appreciate and respect the concerns that have been raised by several individuals on Siesta Key.” The man voiced strong objection to the characterization that only some of the island’s residents oppose the dredging of the pass. “We’re the troublemakers. We’re just terrible!” Luckner said laughingly, referring to the SKA and its members. Luckner also explained that she and other SKA members had met multiple times with City Engineer Alexandrea DavisShaw and representatives of the USACE. In fact, she reminded the audience, the SKA invited Milan Mora of the USACE, who was the Lido project manager at the time, to make a presentation on the proposal during the SKA’s December 2013 meeting at St. Boniface. Audience member Mark Hennessy called out thanks to Luckner for all she has done for the organization in regard to the Lido Renourishment Project, and applause ensued. 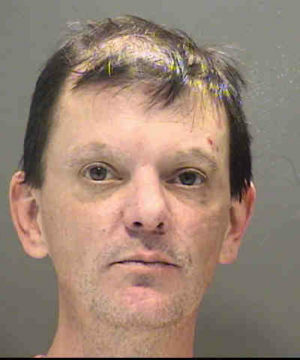 On the evening of Feb. 6, Sarasota County Sheriff’s Office deputies arrested a 46-year-old man on DUI charges after he allegedly struck a bicyclist and then crashed into a pole on Siesta Key, the office announced. Deputies responded to the 500 block of Beach Road around 5:30 p.m. in response to a report of a hit-and-run incident involving a bicyclist, a news release said. While investigating the crash, deputies learned that the same vehicle had plowed into a pole a short distance away, in the 6100 block of Midnight Pass Road, the release adds. The bicyclist “suffered abrasions to his arms,” the report said. Officers found Brynley R. Jones was sitting on the sidewalk, “next to his damaged [BMW] convertible,” the release noted. Finally, the sergeant informed Jones he was on Siesta Key, the report noted. Jones responded, “I’m sorry I’m drunk,” the report said. When the sergeant once more asked Jones where he had been earlier, Jones replied, “A bar,” adding that he had been in Siesta Village. Jones was taken to the Sarasota County Jail for observation and a blood alcohol test, which revealed 0.233 blood alcohol content, nearly three times the legal limit, the release points out. A resident of 5209 Calle Menorca Drive, Unit 213, Jones was charged with two counts of DUI with a blood alcohol level of 0.15 or higher, two counts of DUI with Property Damage, Hit and Run, and Resisting an Officer without Violence. He was released on the evening of Feb. 7 on $3,000 bond, the news release said. The report also noted that Jones was retired from the U.S. Army.